We have large red ants and mounds all over our property, and all through our vegetable garden. Does anyone know a good way to totally get rid of them? We want them out of our garden for good, and obviously we need something that will not harm the plants, vegetables or us when we eat them. Can someone help please? 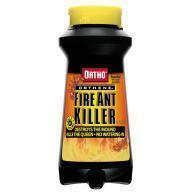 Ortho Fire-ant Killer is the best and fastest way to get rid of fire ants. I've tried everything on the market and every homemade remedy I knew of. This is the best ever. I sprinkle just a little on the mound. Within a few hours the ants are gone (and they don't come back). I use Epsom salts mixed with ground up orange peels that have been left in a jar overnight so the orange oil can soak into the Epsom salts. Sprinkle it around any place you see ants and in ant mounds and they will move away quick. Here is the website I first found this on.